The early Mars ocean known as Arabia (left in blue) would have looked much like this when it formed on the Red Planet 4 billion years ago, when the planet's smaller Deuteronilus ocean was 3.6 billion years old. Their water is now gone, possibly frozen underground or partially lost to space. The rise of the largest volcanoes in the solar system may have led Mars to possess oceans hundreds of millions of years earlier than previously thought, a new study finds. Although Mars is now cold and dry, there is widespread evidence that oceans once covered much of the Red Planet's surface. However, there are scientists who hotly debate this idea, arguing that there are plenty of signs against Mars once having seas. Previous research has suggested the variations in these shorelines might have occurred after the formation of Tharsis, a region 3,000 miles (4,800 kilometers) wide that holds the biggest volcanoes in the solar system. The creation of a "volcanic province" with the mass of Tharsis could have shifted the axis on which Mars spins, potentially explaining shoreline elevation variations. However, for Tharsis to change Mars' pole of rotation, this volcanic region would need to have formed far from the equator. In contrast, prior work found that it formed near the equator. 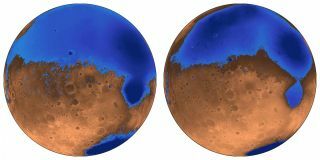 Now, researchers suggest that Tharsis could help explain the irregular shorelines of Mars if oceans on the Red Planet existed before and/or during the time that Tharsis arose 3.7 billion years ago, instead of afterward, as once assumed. This new model suggests that oceans on Mars formed hundreds of millions of years earlier than previously thought. The Tharsis volcanic region of Mars, as seen by NASA's Viking mission. At left is the enormous Olympus Mons. The chain of volcanoes at lower right consists of, from bottom to top, Arsia, Pavonis and Ascraeus Mons. The scientists modeled what previous research suggested was the first ocean of Mars, called Arabia, as well as a subsequent ocean, called Deuteronilus. They next calculated the effects of the rise of Tharsis on these oceans. The scientists found that, if Arabia started forming on Mars at least 4 billion years ago and existed, perhaps intermittently, during as much as the first 20 percent of the growth of Tharsis, the volcanic province could have deformed Arabia's shoreline over time. Similarly, irregularities seen in the shoreline of Deuteronilus could be explained if it formed about 3.6 billion years ago, during the last 17 percent of Tharsis' growth. "Massive deformation by Tharsis could explain why these shorelines deviated from a constant elevation," Citron said. In addition, these findings suggested that the oceans on ancient Mars were shallower than previously thought. If the seas filled before Tharsis was fully formed — and therefore hadn't deformed the Red Planet crust too much yet — they would have held about half the water of prior estimates, the researchers determined. The scientists also suggested that the volcanic eruptions that created Tharsis also generated channels that allowed water to fill the northern plains. This would account for the valley networks seen on Mars. Tharsis likely spewed gases into the atmosphere that created a global warming or greenhouse effect, said study senior author Michael Manga, also of UC Berkeley. This may have enabled liquid water to exist on the Martian surface, he added. To further test these findings, more precise mapping and dating of Tharsis and these ancient shorelines is needed, Citron said. NASA's next Mars lander, InSight (Interior Exploration using Seismic Investigations, Geodesy and Heat Transport), which is scheduled for launch in May, will place a seismometer on the surface to probe the Red Planet's interior. "It could potentially detect the presence of subsurface frozen water, which could be a remnant of a past ocean," Citron said. The scientists detailed their findingsonline March 19 in the journal Nature.